This scientific event addresses specialists as well as physics-inclined laymen. 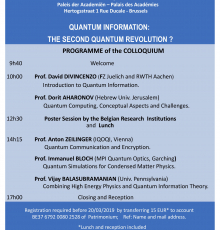 Five eminent experts, known for their outreach skills, will discuss how quantum information can lead to dramatic improvements in the acquisition, transfer and processing of information. Teleportation of information, unbreakable codes and very powerful quantum computers are some of the exciting examples. Registration is required by March 20.